This article was originally published at covertbitops.cjb.net on 6th march 2002. So, basically I�have crossdevelopment to thank for all my C64 achievements worth mentioning. - If testing on an emulator, remember that graphics (TV image blurriness!) & sound emulation are not 100% accurate yet, and probably will never be. Processor- & chip-emulation are very accurate nowadays in good emulators (for example CCS64, VICE). If your program runs in both CCS64 & VICE you can be pretty much sure that it will also on the real machine. My experience with different results on different emulators was the loader bug in Metal Warrior 2 (version 1.1p). If loading the intro-part (loading picture) first, the game would later freeze when it was loading the first ingame level file. In VICE this bug never showed up but on CCS64 & a real C64 it did. The actual cause of this bug is a mystery even today (it was later removed by integrating the MW3 loader fully) but the point is to show the importance of testing on many emulators. - If testing on the real machine, some effort is required to transfer the program over (for example, with Star Commander and an X1541 cable). But I�strongly recommend testing on the real machine, whenever possible! - Making small test changes to code & data (for example with a freezer cartridge) during run-time can be more convenient than recompiling the project within the crossdevelopment-system. This one is simple: I�use TSE (DOS based editor, great keyboard commands) to edit the source code. I�split source code to multiple files based on their purposes (for example all raster interrupt code goes to one file, all scrolling code goes to another) to keep things manageable. Also, with the memory not being a concern like in C64 based combined editor/assemblers (Turboassembler for example) I�can comment as much as I�want and use as long label names as needed. - Blocks are 5�5 chars. What if you want 4�4? So, it is likely that a custom utility is needed. I�have no doubt that I�will write a DOS/Windows based editor in C language faster than I�could write a C64 based editor in assembly language (and an editor written in BASIC would be intolerably slow for any larger amounts of work, in most cases) This, like everything, is a matter of preference. For others it can be faster to write a C64 based utility, even in assembly language. 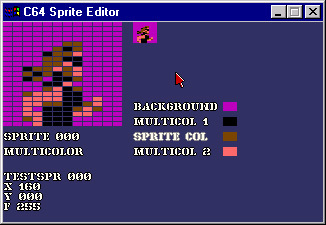 And once I�got my first background editor finished, the common routines and graphics were also convenient to use for a PC-based sprite editor as�well. 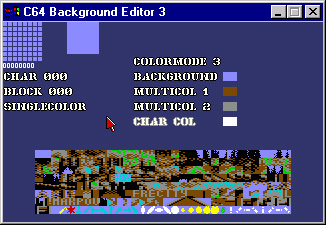 The problem is this: C64 can have only three different colors + background color in a character cell. But how I�know if I�exceed this limit in a non-C64 paint program? There is no way, except by examining the pixels by eye, or testing the picture within a C64 program. For the conversion of IFF/LBM pictures to C64 usable format, I�use simple, self-written utilities. 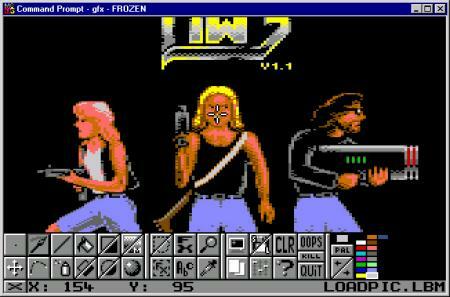 I�know this method is a bit weird and therefore I&#146;d rather recommend using a C64 bitmap paint program. However, it&#146;s�worth trying once in a lifetime! - Editing music directly in source code as byte data. Symbolic defines can help this process (for example note names) but still I�can&#146;t really recommend this method to anyone working today. This is useful if one has to squeeze every last byte out of the music�data. A�complex production might be composed of many files that are for example loaded from disk as needed. So it would be clumsy to have to type all assembling & data-manipulation commands by hand each time something needs to be changed. A�batch file will do fine in most cases; simply gather all commands required to fully compile the program. Don&#146;t want to wait minutes or hours for a C64-based packer or cruncher to finish? I�have a simple advice, use Pucrunch by Pasi &#146;Albert&#146; Ojala! Can be even integrated quite easily into a loadersystem. Now there&#146;s�a bunch of files sitting on the harddisk that are ready for execution/loading on the C64. If there&#146;s�only one file, the executable, the next step is unnecessary; the file can be transferred onto a C64 floppy, directly to the C64 with the PC64 cable, or run in an emulator. Also, if testing happens exclusively on a real C64, a multi-part program can be transferred one file at a time onto a C64 floppy. I�wish luck in your C64 programming / crossdevelopment efforts, whatever they might�be! This article was originally published at covertbitops.cjb.net on 6th march�2002. This article has been displayed for 2383 times, since publishing.